The Bulls Sunday again seemed to get mixed up with that day of rest thing, another slow start leading to another near end to end loss. The Milwaukee Bucks took a double digit lead midway through the second quarter and kept it the rest of the game for a 110-96 victory over the Bulls. The Bulls fell behind after a 4-0 start with a careless first quarter with seven turnovers. The reserves again provided the boost and energy, but the Bucks took control late in the second quarter to take a 19-point halftime lead and remain unthreatened throughout the second half. The Bulls fell to 18-32 with their fourth straight loss. The Bucks moved to 26-22. The Bulls now head west to play in Portland Wednesday. The next home game is Feb. 9 with the return of Jimmy Butler and the Minnesota Timberwolves. The Bulls again were led by a reserve with Denzel Valentine scoring 18 points. Lauri Markkanen had 17 points and 10 rebounds. Jerian Grant had 15 points, Justin Holiday 12 and Nikola Mirotic 10. Kris Dunn remained out with his concussion symptoms. Jabari Parker still isn’t back yet from his second ACL surgery and Malcolm Brogdon was out for the Bucks, now being coached by assistant Joe Prunty after Jason Kidd was fired recently. The Bulls starters had yet another indifferent and sloppy opening, seven turnovers by the end of the first quarter. It wasn’t until the reserves led by Valentine came in that the offense began moving again after the Bulls fell behind 13-7. Valentine scored three straight with a pair of off balance floaters and the Bulls trailed 26-20 after one quarter. It still was Valentine with this floaters keeping the Bulls afloat, though the Bucks began to disappear in the distance amidst the Bulls inefficiency. The Bucks nosed ahead 36-24 early in the second quarter. David Nwaba stopped the Bucks run with some hustle plays with secondary help on defense before yet another Bulls series of forced jumpers enabled the Bucks to lead 51-36 with three minutes left even with Giannis Antetokounmpo having little impact early with a one of seven start. He finished with 27 points. The frustration caused Bulls coach Fred Hoiberg to call a timeout less than a minute after a late second quarter Bucks timeout. It didn’t have the desired effect as the Bucks led 61-42 at halftime even with 16 points for Valentine. 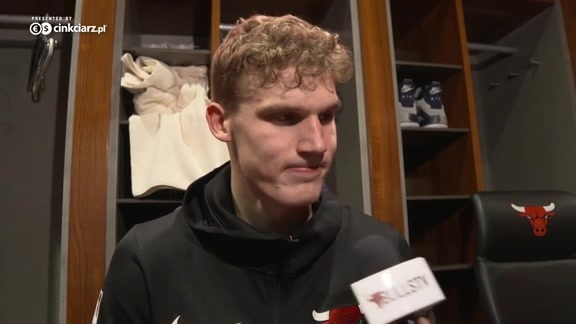 The Bulls opened the second half with threes from Holiday and Markkanen to reduce their deficit to 13. But then it was an Antetokounmpo show with spins and driving dunks to propel the Bucks to a 77-56 lead before Lopez came back with a rolling hook as again the offense stumbled among the starters without Dunn’s presence. The Bulls did get Holiday and Jerian Grant threes to close the third to get with 86-72. Zach LaVine finally scored on a driving layup after starting zero for nine and three of 17 the previous game. But the Bulls couldn’t hold off the Bucks, who led 100-83 midway through the fourth quarter.